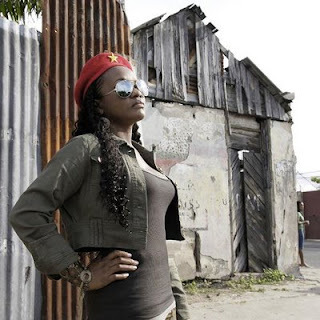 Blueprint Promotions-Since it's release last week, Tanya Stephens' album Infallible has been the proverbial talk of the town. The lyrical maverick's seventh studio album has been found to be nothing short of intense, inspiring and ofcourse littered with witty innuendos. The artiste says, "When I write, I try to stay true to the emotions I know people feel when they go through particular situations. There's nothing a listener hates more than an unrealistic situation. I hope my fans love what I have to offer on this project." The 18-track free album which was released by the independent label, Tarantula Records, already promises to be ranked among some of Tanya's best work, with songs ranging from the somber, Still Alive, the suggestive Bury A Bone and Siddung Pon It to the more emotive Just For Me - there's something for everyone on the album. "I like variety. That's how I grew up. I lived in a home where every kind of music was played and now, that's something that comes out in my music," said the artiste whose most compelling work spans the early 90s to the present, with hits such as Yuh Nuh Ready Fi Dis Yet, It's A Pity, Boom Wuk, These Streets and more. "I hope everyone will continue to download and play the album because it's free and this is something that I wanted to do for the fans for showing their support through the years, and I want to say thanks to everyone for showing so much love since the album's release," she said.